* Can open MDB and Accdb files. * Table opening, viewing and inline editing. * Standard search and partial word search. 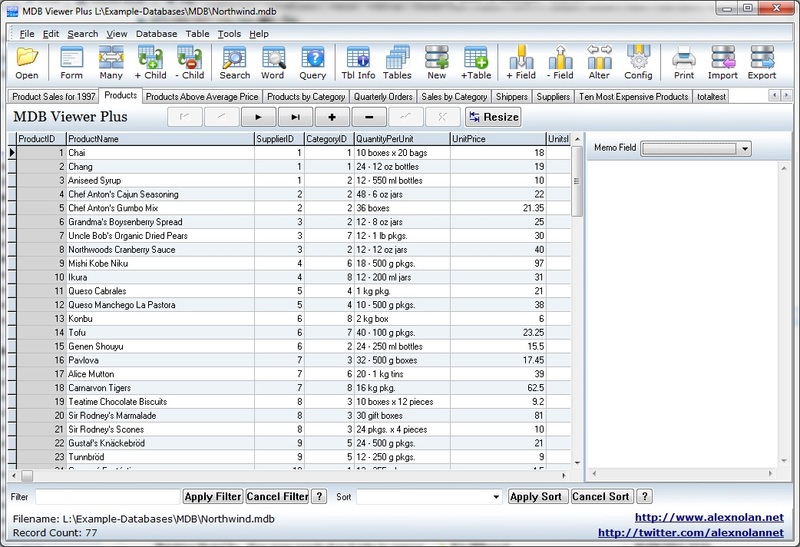 * Filtering / sorting records by fields. * Table and query result printing. * Record view (form style view). * Query - standard SQL select statements. * Opening and saving of SQL statements to file. * Table Info (field types) plus printing of structure. * Exports to TXT, HTML, XML, DBF, XLS, WKS, RTF and PDF. 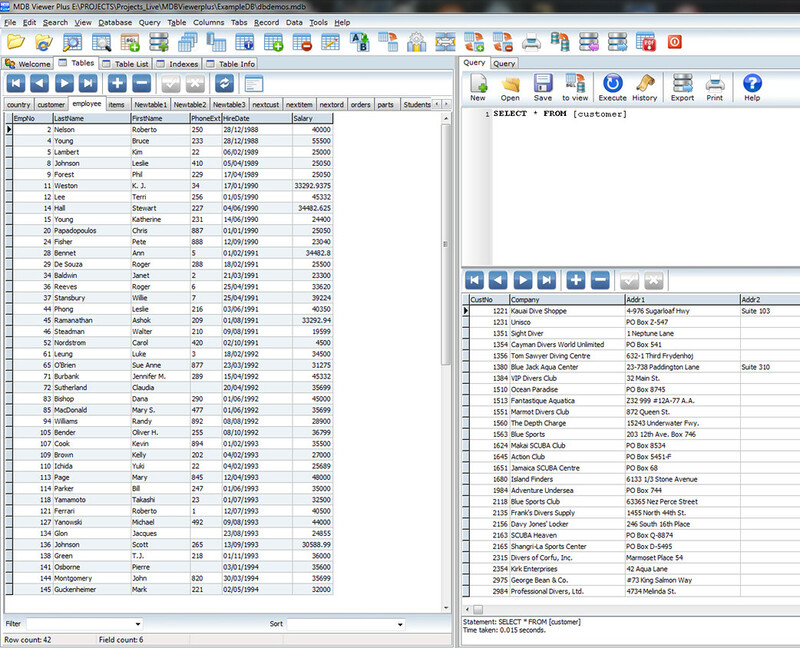 * Import from CSV,TXT,Doc,XLS,WK1,WQ1,SAV,DB,DBF,MDB,ADO,ADT,DAT,HTM,XML,WAB and VCS. * Support Access 2007 Accdb files (Provided "Microsoft Office Access database engine 2007" is installed). * Create new blank database. * Create / rename / delete table. * Set / change / remove password. * Support for Workgroup Files (MDW). * Display related child table link to the parent table. * Add / remove / rename / alter fields. * Customisable many to many relationship dialog. * Selective opening of tables. This is the maintenance release to fix a few issues that have come up as a result of all the major alterations of version 2.58. I have improved the recent dialogue window a little. There will be another maintenance release in another couple of days. All MDB Viewer Plus reviews, submitted ratings and written comments become the sole property of Windows 7 download. You acknowledge that you, not windows7download, are responsible for the contents of your submission. However, windows7download reserves the right to remove or refuse to post any submission for any reason. Windows 7 Download periodically updates pricing and software information of MDB Viewer Plus full version from the publisher, but some information may be out-of-date. You should confirm all information. Using warez version, crack, warez passwords, patches, serial numbers, registration codes, key generator, pirate key, keymaker or keygen for MDB Viewer Plus license key is illegal and prevent future development of MDB Viewer Plus. Download links are directly from our mirrors or publisher's website, MDB Viewer Plus torrent or shared files from free file sharing and free upload services, including Rapidshare, MegaUpload, YouSendIt, SendSpace, DepositFiles, DivShare, HellShare, HotFile, FileServe or MediaFire, are not used.